Yesterday, as I earlier mentioned, Lisa and I drove over to Portola to visit the Western Pacific Railroad Museum. Lisa and I are members (which includes free admission), but it had been almost two years since our last visit, as we misread the museum's open dates last October after they'd closed for the season. After establishing our membership credentials at the front desk, we got wristbands. 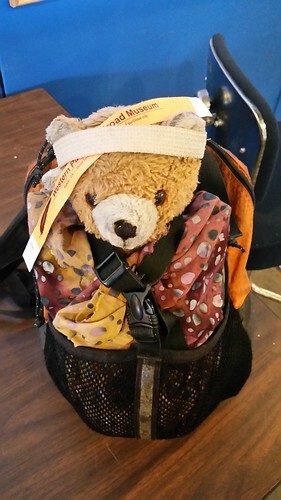 Kuma Bear held on to Lisa's while she went to wash her hands. 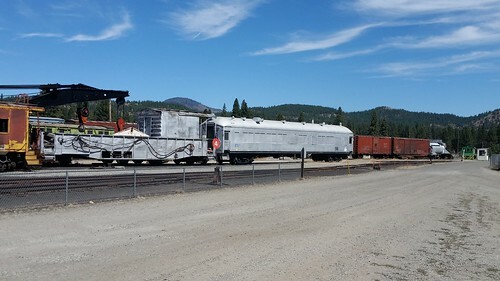 I'd intended to renew our memberships as well, but forgot to bring the renewal letter, and apparently they can't take renewals at the museum itself without the renewal letter, as it has to go to the Feather River Rail Society official who processes renewals. I took a few photos, but not many. 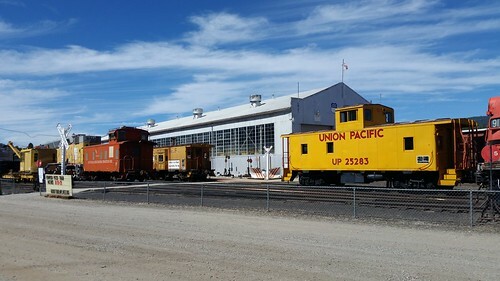 The big building is the former Western Pacific Railway shops at Portola, which was the division point between the western (Oakland-Portola) and eastern (Portola-Salt Lake City) halves of the railroad. Today it holds displays, the gift shop, stores, and equipment under restoration. 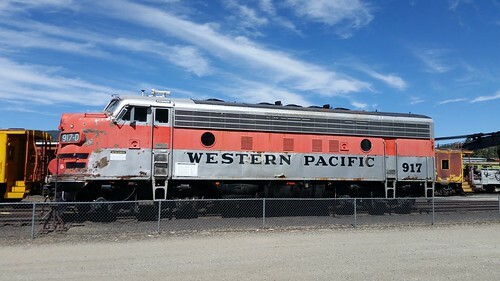 There is a whole lot of equipment on the property, not just from the WPRR, but from affiliated railroads like the Sacramento Northern (my "hometown" railroad in Yuba City, it was originally an interurban electric railroad before becoming mostly a small feeder into the WPRR), the Tidewater Southern, Central California Traction, Union Pacific (which merged the WPRR in 1985), and also a few things from other neighboring roads, like a rotary snowplow from the Southern Pacific. There were no trains to ride today because train rides only are offered Memorial Day to Labor Day (plus special events like pumpkin patch trains and Santa Trains, but that's later in the year), so the museum was rather quiet. However, that was helpful for Lisa, who brought the Panasonic P2 and the remote microphone and put me to work doing a impromptu documentary about the museum. This gives Lisa practice working the camera, and it will give me practice using the editing software. It's more complex than turning WSFS Business Meeting videos into usable YouTube MP4s, but unlike WSFS, there's no time pressure.